Remember that commercial? It was a long-used marketing slogan for Lay’s Potato Chips – the most memorable (airing in Canada in the late 1990s and early 2000s) being the one with hockey player Mark Messier. Potato chips. They are an Achilles Heel for me. I cannot eat just one. I can eat any sized bag all by myself. Eating them is fun, a treat, an indulgence, but I have regrets after, and from the perspective of calories alone I rarely buy them. It’s the only way. The hankering for potato chips resides in the same part of my brain reserved for cravings for French fries. Similar story – some fries are good – some, not so much. Hands down best fries IMHO are from Jamie Kennedy. It was the first thing we'd order in his restaurants – nibbling while we pondered the rest of the menu. Are potatoes good for us? We have been trained to think “potatoes” = “carbs” = “bad”. More likely, it’s how we cook them or what we bury the potatoes under that can be the problem. I have a few potato pet peeves. I have noticed that British Food magazines always tend to show a wide variety of potatoes – in fact, they claim 18 varieties. In my grocery stores, here are my choices - white flesh, yellow flesh, and baking aka russet; little/baby potatoes, fingerlings, heirloom purples. Often, “yellow flesh” refers to Yukon Gold – a potato variety developed right here in Ontario at the University of Guelph. In fact, May 2016 was its 50th anniversary! Now here’s a shock. 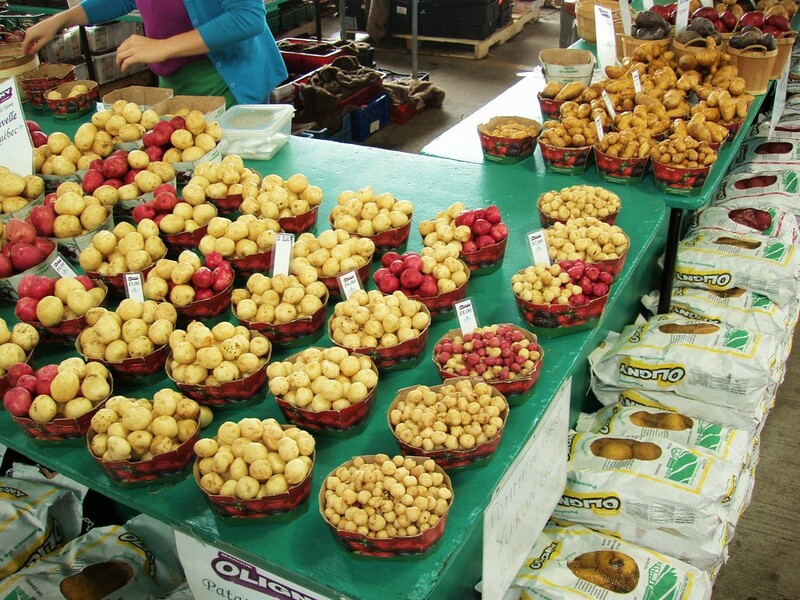 While prepping this blog, I discovered that Canada also boasts a wide variety of potatoes! Why are they not sold under any of these names?? Speaking of how they are sold - at the fantastic Jean Talon Market in Montreal – the potatoes are sorted into many different sizes. Love that! Despite the wonders of the internet, I still often return to my trusty ‘Visual Food Encyclopedia” for reading and research. It reminds me that potatoes should be stored in paper bags, in a dark cool dry place. They need to breathe, so storage in plastic bags is not advised. Also better to purchase dirty potatoes vs. cleaned – the cleaning “removes their protective coating, making them more susceptible to bacteria”. “Green” on potatoes indicates they have been exposed to light. @kitchn explains that at the minimum such potatoes need to be aggressively peeled and worse case, because of the potential toxicity – discarded. Early / new potatoes do not even have to be peeled. Am running out of space to share other storage ideas I read about - namely root cellars. I have in fact eaten (melt in your mouth) potatoes in the dead of winter, that had been stored in an outdoor sand-filled root cellar. Every house I have lived in has had a "cold cellar" - which for some reason we call a fruit cellar - yet they were never used to store fresh produce - will have to look into that. There are elegant ways of preparing potatoes, but they seem to have also been a staple peasant food. In my kitchen - which often features Hungarian cuisine – there are many meals that use potatoes. Krumplis teszta translates as potato pasta - a double dose of carbs!! - but it’s a staple in every Hungarian kitchen. Onions are caramelized - the more the better - and yesterday’s leftover mashed potatoes are added. Stirred into that mixture is cooked broad noodles. (Hungarians have a lot of these rustic pasta dishes – pasta mixed with one of these - cabbage, ricotta (with bacon and bacon fat), poppy seeds, or plum butter - aka lekvar). Most people have heard of Chicken Paprikas – but Hungarians can be just as satisfied with Paprikas Krumpli – potato chunks cooked with onions and paprika – often with pieces of dried smoked kolbasz added. That’s considered to be a great meal – sometimes eaten with hunks of hearty bread - wow… carb city. I could list several more ways that potatoes make an appearance in the KB kitchen, but until the recipes are posted that may seem mean. So far I have posted - Leftover Mashed Potatoes, Mini Potato Gratin, Olive Oil Potato Gratin, and Potato Leek Soup. I’m ending this blog entry with a recent addition – Roasted Salt and Vinegar Smashed Potatoes. What with small new potatoes arriving at local markets, these have appeared on the KB table almost weekly! Bet you can't eat just one!! Use Comments, below, to share or ask questions. Would love to hear about your potato chip, French fries or potato memories and tips. If you enjoyed this read, please take a second to click on "Like"!